No other product in the world can make your hair look this thick and full. Women choose DermMatch because it looks better, stays on better, applies neater and costs less to use. Hair fibers, sprays and other hair loss concealers can't compare. Women are using DermMatch to conceal female hair loss instead of hair fibers and sprays. DermMatch looks better, stays on better, applies neater and costs less to use. 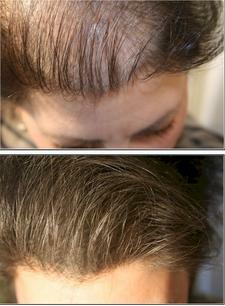 DermMatch makes female hair loss disappear instantly along with all the suffering. It works for women of any age, hair color, skin color or hair style. It works on thin hair, bald areas, hairlines, temples, eyebrows and grey roots. DermMatch is loaded with botanical and naturally derived ingredients. Emollients in the DermMatch formula soften and moisturize your skin.